248 pages | 86 B/W Illus. Full of real-world case studies and practical advice, Exploratory Multivariate Analysis by Example Using R, Second Edition focuses on four fundamental methods of multivariate exploratory data analysis that are most suitable for applications. It covers principal component analysis (PCA) when variables are quantitative, correspondence analysis (CA) and multiple correspondence analysis (MCA) when variables are categorical, and hierarchical cluster analysis. The authors take a geometric point of view that provides a unified vision for exploring multivariate data tables. Within this framework, they present the principles, indicators, and ways of representing and visualising objects that are common to the exploratory methods. The authors show how to use categorical variables in a PCA context in which variables are quantitative, how to handle more than two categorical variables in a CA context in which there are originally two variables, and how to add quantitative variables in an MCA context in which variables are categorical. They also illustrate the methods using examples from various fields, with related R code accessible in the FactoMineR package developed by the authors. "While the book has some of the clearest geometric explanations written on the topic, in terms of inertia possessed by clouds of individuals and variables, its primary function is to operate as a step-by-step walk through on how to visualize, analyze and portray the results of analyses in R. This is accomplished via thought-provoking examples, ranging from wine ratings, decathlons to high-dimensional text-mining and genomic breeding. Data and code are available online, enabling fast cut-and-paste implementation…the book makes an excellent self-tutorial or teaching aid for the whole gamut of students and researchers working in applied fields. The authors are to be congratulated for their contribution to making the implementation of complex analyses ideas simple and implementable in practice." "In the days of "big data" every researcher should be able to summarize and explain multivariate data sets. The purpose of "Exploratory Multivariate Analysis by Example using R" is to provide the practitioner with a sound understanding of, and the tools to apply, an array of multivariate technique (including Principal Components, Correspondence Analysis, and Clustering). The focus is on descriptive techniques, whose purpose is to explore the data from different perspectives, trying to find patterns, but without going into the realm of inferential statistics, with its formal tests of hypotheses, confidence intervals and other more advanced topics. This seems to be the right choice for the audience of non-statisticians to whom the book is directed. The second edition of the book includes a more extensive treatment of missing data and a new chapter on multivariate data visualization - both of which I consider very welcome additions. In summary, I consider "Exploratory Multivariate Analysis by Example using R" to be a good introduction, with an applied slant, to the fundamental multivariate techniques that any researcher should be familiar with." "This second edition is a very appealing book. It exposes both the mathematical theory and the practice of classical multivariate methods in a very accessible, comprehensive, and well-structured way. Real applications are used as examples, with the results interpreted in detail, enhancing the huge potential of this exploratory approach. The R code and the datasets necessary to reproduce the results are provided to the reader, enabling them to write the R code required to analyse their own data. The inclusion of the new chapter on visualisation is very welcome, as it shows how outputs need to be carefully constructed. This book will definitely be appreciated by applied statisticians and also students, practitioners, and researchers from a large range of disciplines." "The first edition of this book provided an excellent introductory (and therefore largely non-technical) overview of PCA, CA and hierarchical clustering techniques using FactorminoR. The authors have expanded upon their original work but have given the reader additional insights with specific attention paid to missing data and further guidance on the usability of R. The book has lots of very interesting examples, which are very well described and analysed. Just like the first edition, this second edition of this book is definitely a great resource that deserves a place on one’s shelf or online library." "The book by Husson, Le and Pages has extensive chapters on Correspondence Analysis and Multiple Correspondence Analysis for doing dimension reduction on contingency tables. As such, it has extensive chapters on Correspondence Analysis and Multiple Correspondence Analysis for doing dimension reduction on contingency tables. Written for non-specialists it provides explanations and examples for their popular R package (FactoMineR), each chapter provides a careful summary of important functions. The book uses many real examples to illustrate the methods and provides clear explanations of the standard French interpretive tools (inertia explained and correlation circles for instance). This new addition has new material on missing data, a bane for data scientists in all fields that is often swept under the rug, this will prove invaluable to applied scientists looking to make the most of their always imperfect 'messy' data." "Do you have complex multivariate data, and want to explore patterns and visualize associations? Then this book is the way to go. Husson, Le, and Pagès, the giants of the French school of correspondence analysis, take the reader on a "tour d'analyse des données". Every researcher interested in exploratory multivariate analysis in R should have this book on their shelf. Five stars out of five." 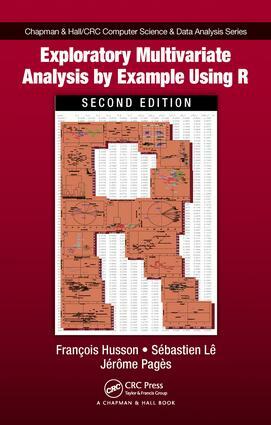 Exploratory Multivariate Analysis by Example Using R provides a very good overview of the application of three multivariate analysis techniques … There is a clear exposition of the use of [R] code throughout … this book does not express the mathematical concepts in matrix form. This is clearly advantageous for those who are considering the book from an applied perspective. This, I think, is refreshing and is done well. … I therefore recommend the book to those who are interested in an introduction to these multivariate techniques. … the book does provide a solid starting point for those who are just starting out. … definitely a book to have in one’s … library. Its strength is its detailed advice on interpretation, in the context of varied examples. It is written in a pleasant and engaging style … This text is a great source of worked examples and accompanying commentary. It is an excellent book which I would strongly recommend as a secondary text, supporting or accompanying the main text for any advanced undergraduate or graduate course in multivariate analysis. … this is a compact book with a plethora of visualizations teaching all subtleties of major data exploratory methods. It would supplement well any primary textbook in an advanced undergraduate or graduate course in multivariate analysis. … a truly excellent [chapter] on clustering … is an example of what upper-division undergraduate writing should aspire to. … this enjoyable book and the FactoMineR package are highly recommended for an upper-division undergraduate or beginning graduate-level course in MVA. The acid test for such a work must be whether it is likely to spark an interest in students and prepare them adequately for more detailed, serious study of the subject and this book easily passes that test.